TO-5 and TO-100 transistor sockets make field insertion and removal of transistors and diodes easy and convenient. Inside each transistor socket are precision machined, brass alloy receptacles assembled with a Mill-Max, 4-finger contact. providing a hi-rel mechanical and electrical connection to the mated transistor lead. Mill-Max transistor sockets contacts have a pin diameter acceptance range of .015"-.025". Their current rating is 3 AMPs per position. Both the surface mount and through-hole transistor sockets utilize high temperature thermoplastic suitable for both wave-soldering and reflow soldering. 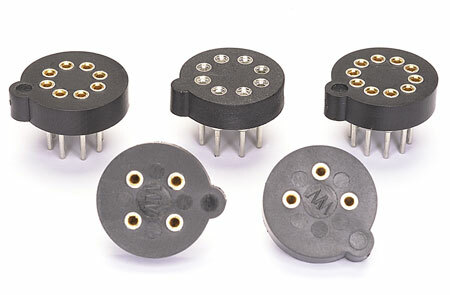 Series 917 TO package sockets are available in 3, 4, 8 and 10 positions. Two 8 pin versions feature pin centers on .200" and .230" diameter circles. Through-hole TO-5 and TO-100 sockets are currently packaged in bulk while the Surface Mount TO socket is available on Tape and Reel.